Price: $59.99 USD – Available Here, $119.95 AU – Available Here. It really isn’t a secret that the toys-to-life genre is winding down to a halt. While we do see minor innovations from time to time with the once wildly successful cash cow, retailers have struggled to push toys as gamers have kind of tucked in their wallets, opting for digital DLC yet again. Ubisoft bring us Starlink to simply give us a little of their take, offering a new experience where the toys are but an option and the gameplay is the selling point. 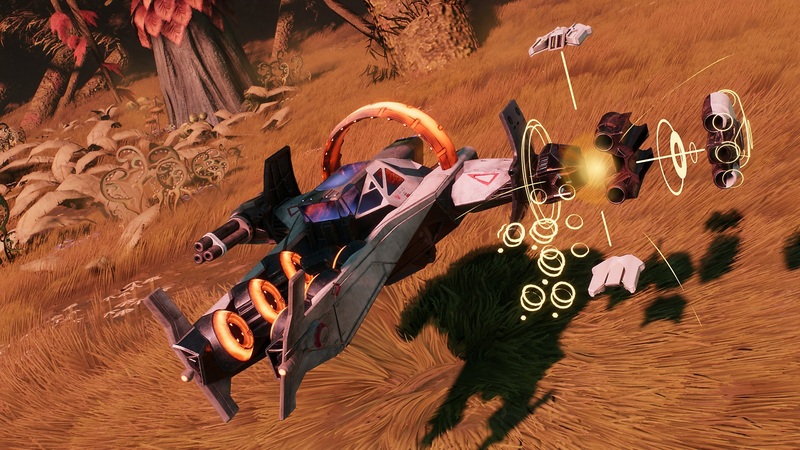 Does Starlink: Battle for Atlas have enough meat to be worthy of a visit, or is it a last attempt that will quickly hit clearance racks? Let’s find out. Starlink takes place within the Atlas star system. Players take the role of their choice of pilot, and must take to the skies and land on a planet down below in what generally is a bout demanding exploration. It is your job to find life, form alliances, and essentially out perform the antagonist Grax, as he looks to takeover the system with evil motives at hand. Listen, the plot is serviceable and does its job, but it mainly acts as a shell that the players fill with their own imaginations as they explore. This title reminds me a bit of what No Man’s Sky would be if it married Project Sylpheed. Ubisoft did a great job with dialogue bits and general lore for the universe, but don’t go in expecting a Mass Effect plot, as the characters never feel fleshed out enough during the experience where the player has much reason to care about most of their existence. Exploration is fun, but without dynamic relationships and meaning, there isn’t a whole lot of juicy narrative to season the overall experience. Players start out with two weapons and are quickly sent to space in this game. Weapons all have varying techniques, with the ability to freeze, burn, or blast enemies – and players must utilize their full arsenal in order to quickly dominate foes. Since every enemy has a weakness, this means you as the player must collect upgrades and pieces to enhance this arsenal, as even though most enemies will eventually drop with consistent fire, most will drop in quicker fashion if the player has the right weapon equipped for the weakness. It is a smart system that takes advantage of the environment in order to require exploration for what is definitely a beautiful world. The gameplay itself is thankfully smooth, as space combat differs little from that on land, aside from the wide roam scope players have in the sky. Yes, a lot of games (even Battlefront more recently) have had trouble blending the two, but as advertised, the experience here is seamless between land and space, meaning that navigation and general combat fare are handled with ease due to a functionable camera and accessible controls. Planets are also vastly different, and the alliances you form changes up the experience as enemies soon become allies in a galactic struggle. There is a lot of exploration and genuine effort put in to add hours to the gameplay clock, as with four ships that all feel different and a ton of things to collect, one can spend a hefty amount of time on a planet before attempting to move on. The issue is that Starlink doesn’t really deviate enough to demand one’s constant attention. 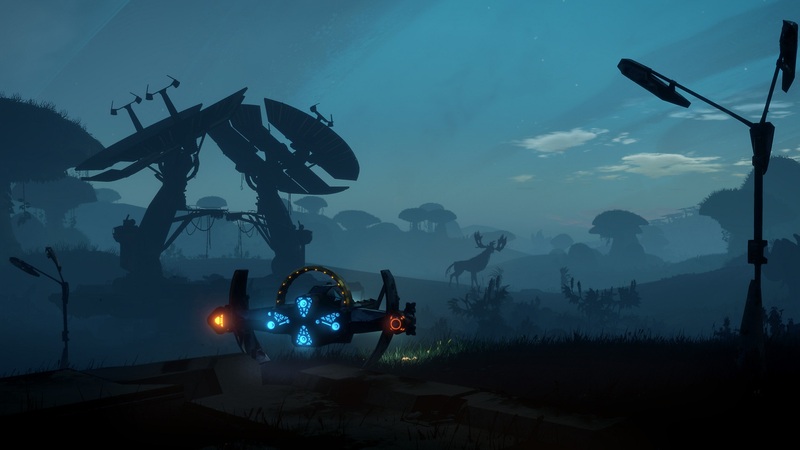 After nearly thirty hours I feel that I have gotten a lot from Starlink, but I also feel that I would be more hungry to play the game if there were more to do overall. Yes, the alliances add to that by changing up a planet’s format, but there still is a time one can feel a bit bored in what is a decently crafted universe that should simply have more substance to it. The toys are optional as they literally allow the player to change pieces on their ship (held in a plastic dock), but seem a bit cumbersome to “toy” with as it can be a bit tedious to do all of this when it is so easy to simply switch out pieces with buttons compared to pulling apart plastic. Sure, the idea is clever, but for this adventure it is a lot more fluid just sticking to pure digital fare. 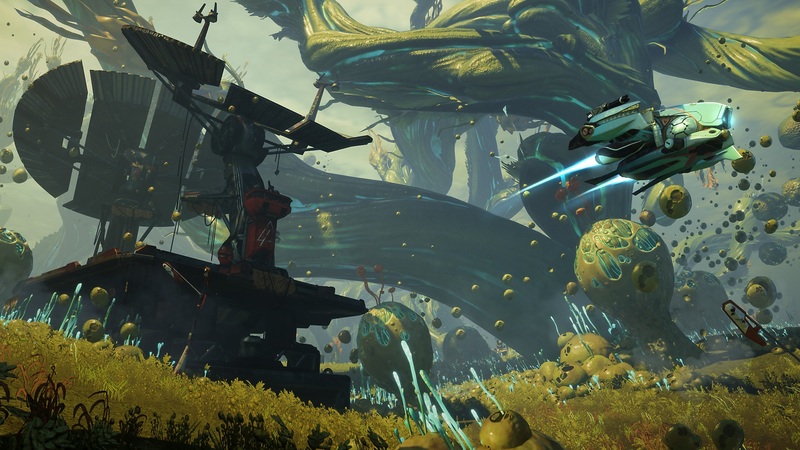 Starlink is a pretty game. The planets are all memorizing and are fun to explore, while the pilots and character models themselves capture a certain innocence that one may see in a Saturday morning cartoon. The animations are also well done, with constant action in the skies never slowing down as one takes part in epic boss encounters or while fighting many mobs of opponents at once. Could we use a little more detail? Not really. 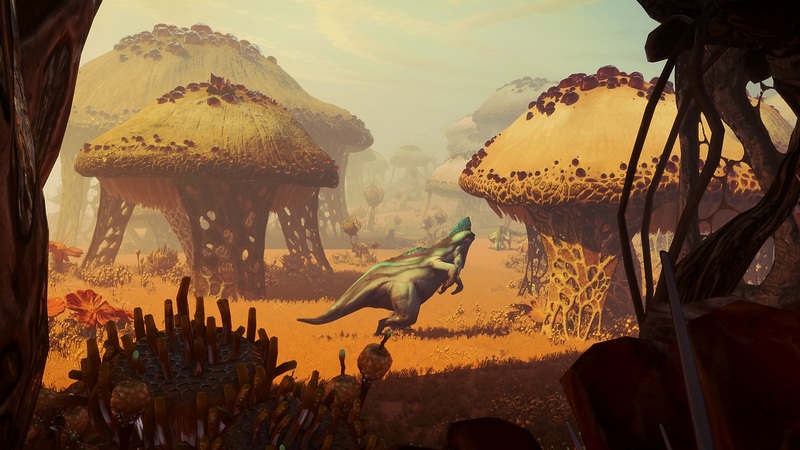 I would rather ask for more character and quirk to go with this adventure, as Starlink has a world meant to explore, but lacks a lot of personality to match. The audio is well done. While not perfect, the voice acting does its job and the sounds of the ships do well to create a great atmosphere of both space and land alike. The soundtrack also serves the game, presenting melodies that paint a little more life into each environment and make intense battles more satisfying overall. Again, I do wish this too was a little more memorable, but alas it does its job. 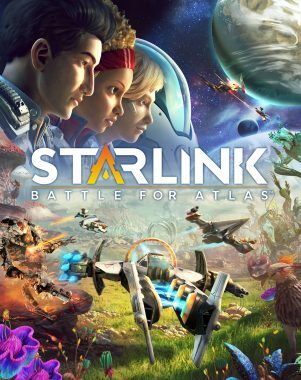 I like Starlink: Battle for Atlas. It’s a great concept that is executed well, and the demand of adding new toys never really hinders the experience for one who just want to play the game digitally. That said, there needs to be more substance to create a more fulfilling journey, as while this title is sure to scratch an itch for space combat for some, others will feel that it lacks what other games in the same genre have brought to us before. 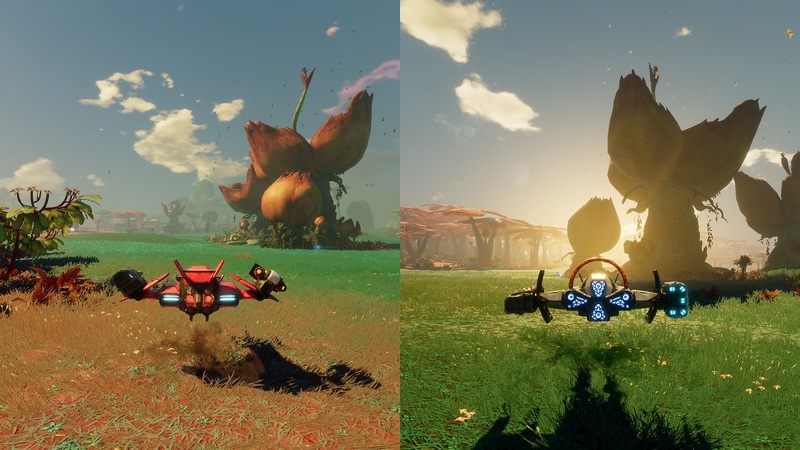 Starlink reminds me of a lot of games that are good overall, function as promised, and leave you with little to say negative, but that is the problem. There are not enough memorable moments and depth to truly make this adventure legendary. We do however have a fantastic foundation for what could be Ubisoft’s newest franchise, so maybe the best is still yet to come with Starlink. For now, this journey is definitely worth its price of admission for those willing to give it a try. Starlink comes in as a solid experience, adding new incentive to collect toys and reach for the stars.